The Skipper So far, a disappointment! Smack dab here at midseason, there’s little question that the cellar-dwelling Democratic National Party (DNP) of U.S. Major League Government (MLG) needs help. 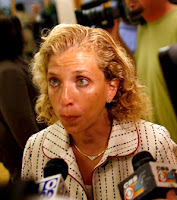 The fans know it, the team knows it, and so does the Skipper of the DNP, Debbie “Pops” Wasserman-Schultz. “We need help in every phase of the game,” said "Pops." “That means hitting, pitching, driving the national debate about the need for increased revenue as part of a balanced program of deficit reduction, and scratching below the waist." The Skipper doesn’t spare criticism for the team’s marquee player. “Barak O. can't buy a hit, and the guy certainly won't get anywhere on balls! 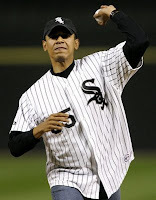 I’m sending him down to the minors for a lot more seasoning at our Triple A Farm City Council in Akron Ohio." Can we expect some activity as the trade deadline looms? “Sure we need trades,” exclaimed the Skipper, "but what trade bait we got? Harry Reid plus a promising young student council president don't get you a Michele Bachmann, who by the way is now represented by powerhouse agent Drew Rosenhaus!" Wasserman-Schultz cautioned fans not to expect things to get better overnight or, for that matter, over lots and lots and lots of nights. "After all," she said, "we're Democrats."